Monday, Jan 07, 2013	It’s a good thing. 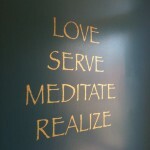 One of our yoga students posted a wonderful tip on her Facebook page at the end of December. It suggested that you get an empty jar and leave it where you will see it on a regular basis. 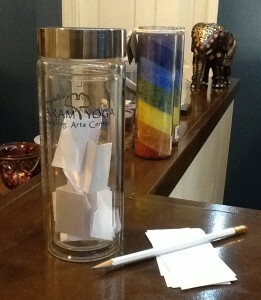 Then, every time something good happens in your life, write it on a piece of paper and put it in the jar. On December 31, 2013, empty the jar and read what’s on all of the papers. You’ll end the year on a positive note (literally!) by seeing all of the great things that happened to you over the past year. We at Param Yoga have taken this suggestion to heart, both at the studio and in our homes, by setting out a jar and keeping small pieces of paper and a pencil handy to jot down our “good things” as they happen. A good thing could be as small as finding a lucky penny or as large as finding your soulmate. The greatest part about this activity is that, in looking for positive things to happen in your life, you are more likely to find them. As believers in the idea that your thoughts and expectations determine your life’s experiences, we know how important it is to focus only on those things that you want to create in your life. The Good Things Jar is one of those tools that can help you steer your thoughts in a positive direction on a daily basis. When a good thing happens in your life or at the studio, particularly if it relates to your yoga practice, you are encouraged to write it down and drop it in our Good Things Jar when you come to the studio for class. At our annual holiday potluck in December, we will empty the jar and read your good things out loud. We wish all of you a year filled with good things. Happy 2013! Marydale has a green hybrid SUV with the license plate BGRNOW (Be Green Now). 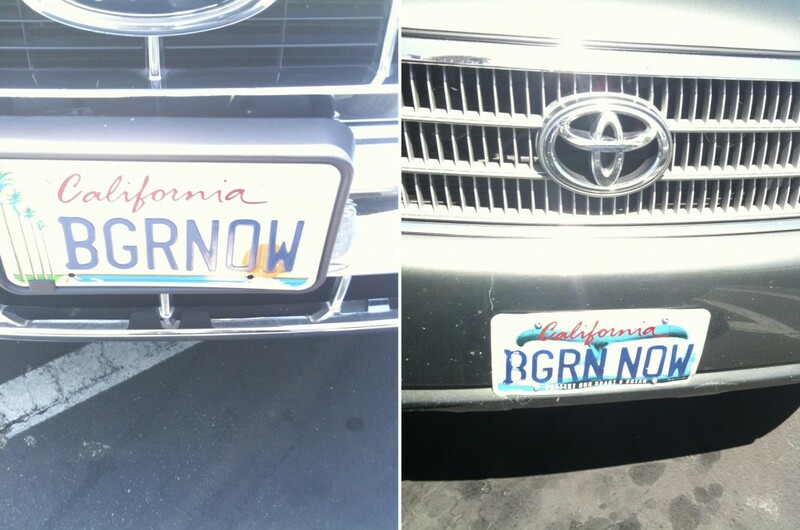 Today, she was out running errands and pulled into a parking space to find that she was nose-to-nose with another green car sporting the license plate BGRN NOW. Normally, I would say, “What is the chance? !”, but this sort of thing is par for the course with Marydale. Marydale likes to serve Tulsi tea after our Yoga & Meditation classes, and our students love it! We now offer Marydale’s 4 favorite flavors: Cinnamon Rose, Original, Red Chai Masala, and Sweet Rose (bags and loose leaf tea canister). Tulsi is naturally caffeine-free, so you can enjoy it at any time of the day or night. Handmade from the stems of the organic Tulsi plant, these beads are believed to bring good fortune to the wearer. 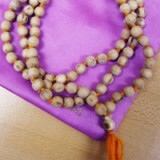 Each mala is composed of 108 beads (a symbol of living in harmony with nature) and comes in a silk drawstring bag. When inhaled, Tulsi essential oil is used to purify the mind. When applied topically, it makes an effective mosquito repellent and can soothe skin infections and acne. Massaged into the muscles and joints, Tulsi essential oil can provide relief from peripheral neuropathy and mild aches and pains. The oil has a sweet, fresh smell that reminds us at the studio of gumdrops! All of the Tulsi products we carry are organically grown by small family farmers in India. Stop by the studio and discover the wonders of Tulsi for yourself! Chyawanprash (CHAI-en-prah-sh) has been called “The Elixir of Life”. It is a delicious jam made from an Ayurvedic recipe including wild forest fruits and 36 different herbs. It is high in antioxidants and vitamin C and contains adaptogens, which improve metabolism and boost immunity. 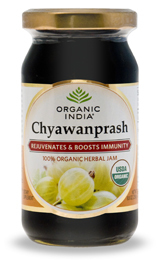 The flavor of Chyawanprash has been described as sour, sweet, pungent, bitter, and astringent. It can be spread on bread or crackers, added to smoothies, or eaten straight from the jar. In India, it is traditionally stirred into a warm glass of milk. Pick up a jar at the studio and make this remarkable superfood a part of your daily diet. Marydale bought herself a Nag Champa candle and fell in love with the scent, so she wanted to carry this intoxicating fragrance in the studio. We now offer the Nag Champa (musk, patchouli, bergamot), Peace (lavender, chamomile, geranium), Love (plumeria, ylang ylang, cinnamon), and Sandalwood (sandalwood, rose, vanilla) candles for sale. All are made from 100% vegetable palm wax and come in a sturdy glass jar with a lid. These richly scented candles burn for 70 hours. 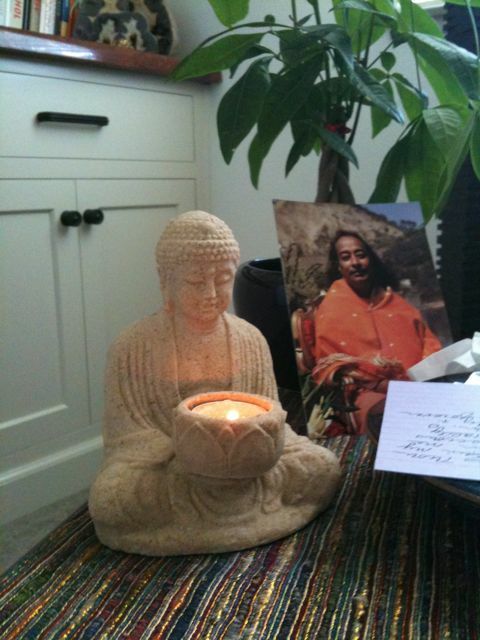 Burning a candle or candles during your meditation or yoga practice can enhance the experience. These chakra candles help you to focus your energies on a particular area by representing the colors and the spirit of each chakra, from the root all the way to the crown. The rainbow candle contains the colors of all the chakras and has proven to be very popular at the studio. These 100% vegetable palm wax candles are unscented and burn for 100 hours. The next time you’re at the studio, browse our selection of candles and enjoy the beautiful aromas and colors. We want to thank Hannah-Childe for another wonderful Jewelry-Making Workshop this past Saturday at Param Yoga. 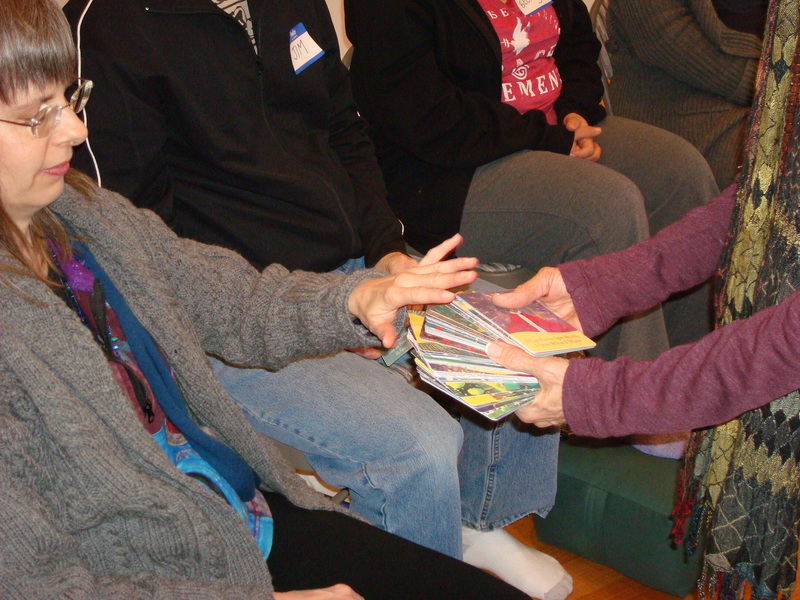 As with the workshop she led for us in November, there was an abundance of creativity and laughter among the group. Hannah was very patient with everyone, teaching the basics of making beautiful jewelry and encouraging participants to let their imaginations run wild. Each person left the workshop with one of her own creations, be it a bracelet, necklace, or pendant. It is extremely satisfying to fashion and wear your own jewelry, knowing that it truly represents you and expresses your unique character. Thanks again, Hannah, for encouraging all of us to free the artist within. To learn more about Hannah and the jewelry creations she makes and sells through her company HannahMade, click here. 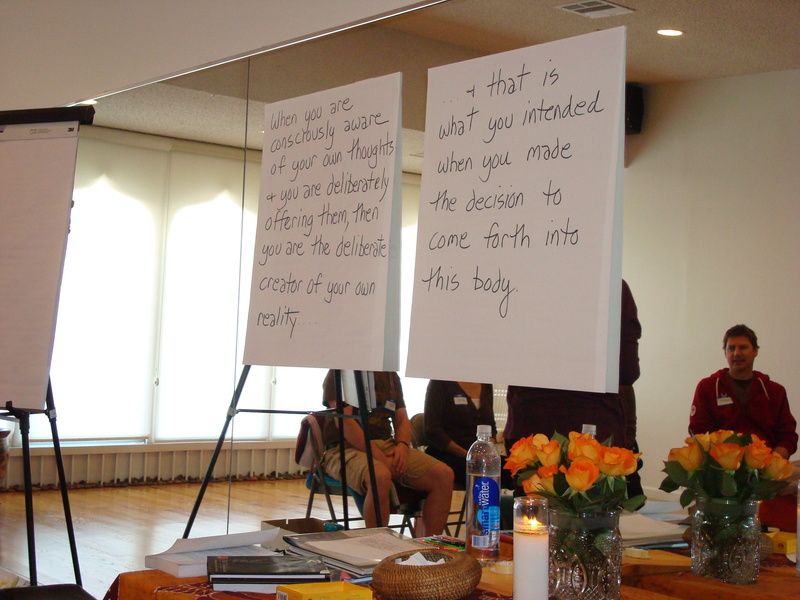 Our Manifestation Workshop this past Saturday was an illuminating and uplifting experience for all who attended. 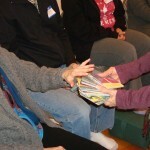 Marydale led an in-depth discussion of the book Ask and It Is Given by Esther and Jerry Hicks (The Teachings of Abraham), going over the processes presented in the book for releasing resistance and lining up with the things we want to manifest in our lives. These things are not just “things”, like money, cars, or jewels, but fulfilling work, loving relationships, healthy bodies, and inner peace. Everyone participated enthusiastically with questions, examples, and personal stories of synchronous events and miraculous manifestations in their own lives. The questions asked by participants were thoughtful and sometimes difficult, but Marydale answered them all in her inimitable way, leading to profound discussions and insights. Through practicing the various processes, areas of resistance were uncovered and participants began to get a clearer picture of what it is they really want to create in their lives. The scope of the information was such that we were only able to cover half of the processes in the book, so, by unanimous request, we will be conducting a follow-up workshop on Sunday, February 12th from 10:00 am – 5:00 pm. 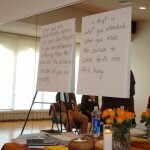 If you missed our first Manifestation Workshop, you won’t want to miss Part 2. You can register online or at the studio, but don’t wait – the workshop is already filling up. 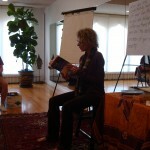 Thank you to all of our Manifestation Workshop participants for an amazing workshop. See you in February! 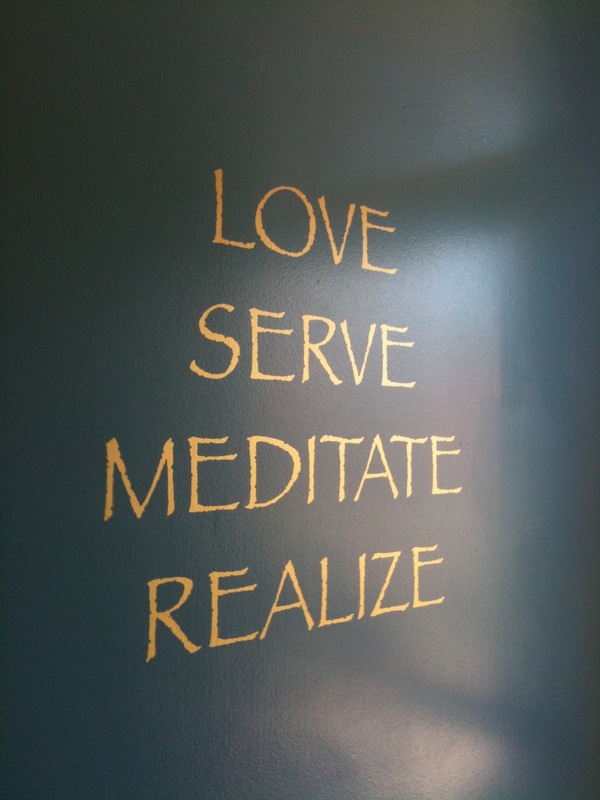 Our motto will now greet you as you walk in the front door of the studio. Sunday, Jun 19, 2011	This little light of mine, I’m gonna let it shine. 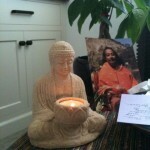 Check out this manifestation of the Yogananda’s pure heart light! 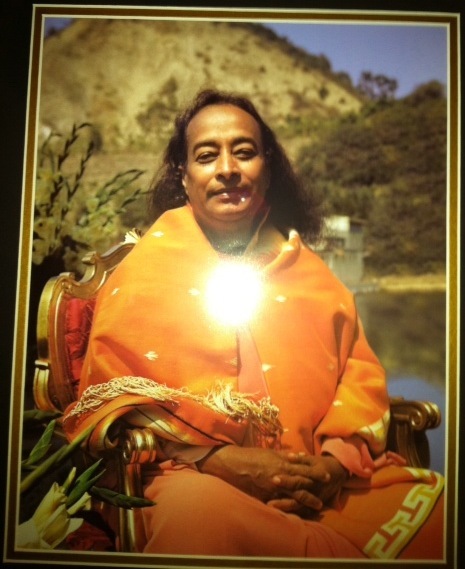 Marydale’s daughter took this photograph of a picture of Paramahansa Yogananda, which was a wedding gift for two of our Param Yoga members who were married this weekend at the Self-Realization Fellowship. 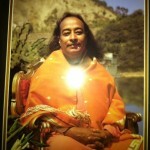 The camera flash hit the glass over the picture in just the right spot to make it appear as if the light of Spirit is flowing out of the Yogananda’s heart center. What a beautiful reminder that magic can be found in everyday things and that the light of Spirit resides in us all. Today I entered Oprah’s Your OWN Show contest for a chance to have my own show on Oprah’s new network. My vision is for a program that expands upon our bi-weekly Gathering with Spirit, where people come together to discuss spiritual issues and soul growth. With the right knowledge and attitude, all actions, interactions, places, and events can become sacred, leading to a life of ease and grace. I want to be able to teach and share these Universal Principles with as many people as possible so that, together, we can uplift and transform the world. View my Audition Video and vote! The five videos with the most votes are guaranteed to move on to the next phase of the competition, although other submissions will still have a chance. I’m not sure I’ll make it to the top five, but I want to build up energetic momentum for my program to assist in its manifestation. Please join me by casting your vote for my audition video. You can vote as many times as you like until the voting ends at 11:59 PM on July 3, 2010. Be sure to tell your friends!